Got a lot out of PKRGSSP’s latest podcast, the one from Tuesday featuring Steve “Chops” Preiss of Wicked Chops Poker, pro player Jon Aguiar, and Pokerati’s Dan Michalski. Interesting discussion throughout regarding the current state of things in poker, with Dan throwing in some interesting thoughts about legislation and the so-called poker media, too. Chops was there, of course, to talk primarily about the Epic Poker League’s recently-updated bankruptcy filings, including the revelation of those hundreds of internet domains the league purchased. And, of course, to discuss how Wicked Chops had in fact been recruited early on by the FS+G crowd to be part of the whole enterprise, though eventually did not get involved. When those URLs became public last week, I tweeted how someone writing a book about the whole EPL saga could pick chapter titles from the web addresses, among which one finds indications of all sorts of behind-the-scenes ideas, strategies, and/or paranoid fantasies. 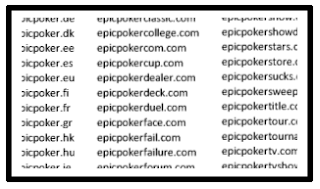 Over half of the domain names include “epic” in one form or another, including matching “epicpoker” with various country suffixes as well as putting the word “epic” next to all variants of poker as well as other games (e.g., epiccheckers.com). Other domains cover all sorts of misspellings (to prevent typosquatting), envision potential product tie-ins (e.g., epictequila.com) or partnerships (e.g. maximpoker.com), and so on. Also listed are URLs like epicpokerfail.com, epicpokersucks.com, and fuckepicpoker.com, some of which were among those I had in mind when suggesting the use of the web addresses as chapter headings. Such would be chosen as titles for the last chapters of such a book, I’d imagine. When I made that comment I was also thinking about the nearly 100 URLs involving the word “wicked” or “wickedpoker,” the reason for which Chops discussed on the PKRGSSP show and in a recent blog post over at Wicked Chops. A most curious part of the story, too, that would rate at least a chapter, maybe more. As Chops explains, an earlier idea by FS+G had involved naming the professional poker league the “Wicked Poker League.” Thus do we see all of those URLs appearing in the list, but that is only part of the story. Interestingly, the plan to give the league this obviously terrible name was being pursued independently of FS+G’s effort to recruit Wicked Chops as a media content provider, although it seems clear the two were connected. 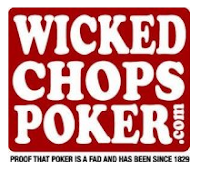 It sounds a lot like FS+G was looking to co-opt whatever value the Wicked Chops Poker brand has for its own purposes, apparently trying to do so without letting the Entities know what was up. Listen to the PKRGSSP show and read Chops’ post for further details about the order of events and how it all went down. To summarize it all, there was some negotiating happening between WCP and the FS+G to partner up in some fashion early on, and eventually those talks evolved into WCP simply managing web content for the new league. However, the FS+G asked for certain conditions regarding the ownership of intellectual property to which the WCP couldn’t cater, and that deal fell through. Meanwhile, the FS+G had apparently decided to call its league the Wicked Poker League, a decision that was made without any consultation with WCP. 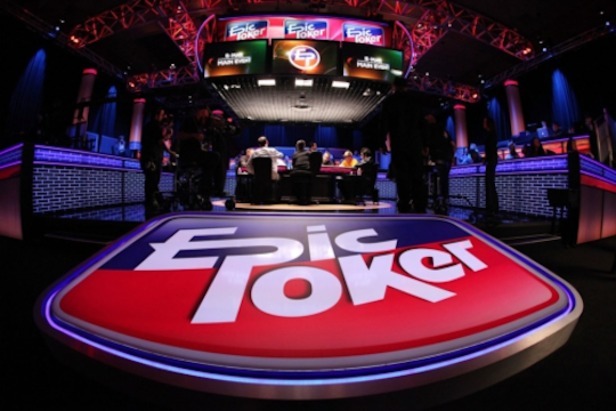 Upon being informed of the plan, WCP “lawyered up” (to use Chops’ phrase) in an effort to protect their brand, and at some point shortly afterward the idea was dropped in favor of going with Epic Poker League as a name. Having heard a little about all of this before -- though without many specifics -- I knew when I saw the list of URLs that there was a reason for the inclusion of all of the “wicked” and “wickedpoker” addresses. I also knew last year that there had been some sort of related falling out between the Wicked Chops guys and the EPL crowd that perhaps partly explained WCP’s antipathy toward the league as expressed in some of its reporting about it. That said, if you go back and read WCP’s posts about Epic you can see occasional, tempered expressions of hope regarding the league appearing amid all of the cynicism. The fact is, a lot of people wanted to see the thing survive somehow and perhaps even realize some of those ambitious goals to help influence mainstream culture’s view poker in a positive way. I was hopeful, too, having been recruited to help contribute to the blog that appeared on one of the few URLs (epicpoker.com) that actually got used. But like Haley says, there obviously was way too much attention being given to HTTPs than ABCs, not to mention a ton of other failures in planning, organization, money management, and just about everything else having to do with the enterprise. I’m imagining another book, a fiction, portraying a world in which all 451 of those URLs were put to meaningful use. A sprawling, episodic adventure in which an “Epic” empire rose to prominence, taking over not just the gaming world but all areas of culture. Just imagine! A world in which citizens of the Federated Poker Union would closely track the Global Poker Index to follow their favorite Epic Poker Players. Where adults would buy Epic Poker Lottery tickets and gamble at the Wicked Sports Book, the younger crowd would earn degrees at Epic Poker University, and the children would happily play with their Tickle Me Danny dolls. Meanwhile, the creators would toast each other, clinking Brunson Cups filled with Epic Scotch while collecting royalties from the Epic Cashier. Went a different direction, though. Too bad. Would’ve been, you know... like really, really big.